World-class products have grazed the electronics industry with the aim of giving its consumer a unique experience. With no doubt, the president CB radio has taken the necessary steps in stamping its recognition in the electronic world, and it speaks for itself. Whenever I think of CB radios the first thing that comes to my mind is president, this is because this company is dedicated to producing the best product that guarantee outstanding performance. I dislike spending my money on anything that is not durable. This will only mean that I will have to replace it again shortly and that is never a good thing economically. With all the jerks and beatings experienced when driving around, The president CB radios offer the highest durability than any of their counterparts, their ability to weigh less and still be able to withstand harsh conditions is one of the reasons I prefer these transceivers. This is a combination that does not come easily, and that’s why it puts them at the top of the competition. With the world constantly changing regarding technology and innovation, The company has gone an extra mile to blend with the new upcoming trends by transforming to meet the consumer needs. They have made an effort to develop a feature called VOX that allows me to put the mic down, lay back and talk to key in the radio, once I pause the radio will wait for a certain length of time depending on my specifications then go on receive mode. That is one of the amazing features I like about these radios. They have also introduced a new SWR test that is both easy and convenient. This shows that they have advanced their technology. 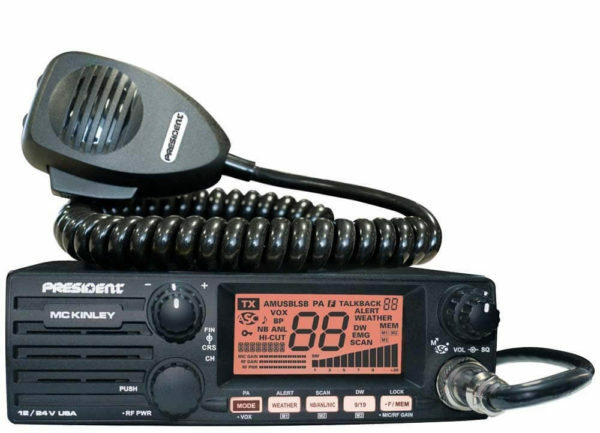 CB radios rely on clarity of the transmission, thus with maximum power output, the president CB radios offer on the high-quality transmissions ever. Sometimes I think this is way too clear for a mobile transceiver. I noticed that immediately I started using it, the transmission was stable and that I did not have any difficulties trying to adjust anything to make it work. This me rate it as the best CB radio of all times. Once it was tuned, I did not need to keep on adjusting the clarifier at all except for a channel that was further. The transmission remained finetuned all through. Since the product is too good and genuinely durable, the company doesn’t have a problem offering long-term guarantees ranging up to two years. This feature shows how sure they are with the durability of the transceivers. When I bought the CB president Johnny III, I did not have any worries that it might spoil soon, I saw the warranty tag, and it was just enough assurance. The warranty clears your doubt and assures you that the radio will last longer than even expected. The president CB radio has introduced a large display with large numbers that are visible, they have coupled that with LCD backlight which comes in different colors that I can adjust to meet my requirements. This makes the display to hold up well in sunlight hence giving me the visibility I require when handling the radio. This is one of the main advancement that I quickly noticed, and it did catch me by surprise. This is one of the highlights of the president CB radios, and that makes it unique from the numerous brands. It is quite a feature. The radio comes with minimal faults. The radio being lightweight many tend to judge it by that, this is one of those features that would turn you away due to suspicion nothing more. Despite it being a great feature it is also too light weighted making people second guess its quality. I also don’t like the six pin very much. This being a mobile transceiver, I would strongly recommend that you fasten it on the dash to prevent damage and falling during movement. This will increase its durability. It is also advised to avoid spillage on the transceiver as this may destroy the mic and other exposed components. Otherwise, it is safe and functional as soon as it is unboxed. I have always been a fun of radios that don’t compromise quality and durability, and I can say that the president CB radios have that figured out. They offer one of the better transmission, captivating display super quality sound clarity and perfect technology that a world-class radio would have. These features place it at the top of its league and make it one of the best companies ever. No mention of any features. Totally worthless review. Yes, what Martha Stewart said! This is one lame review!